Cherries on Top Hunt 6 | ! *PurpleMoon Creations* ! 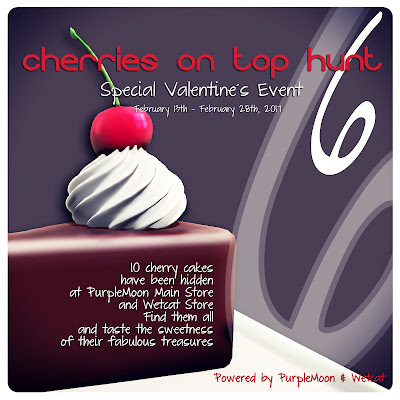 Once again "Cherries on Top Hunt VI" brings fun and love to SL! 10 cherries have been hidden at the PurpleMoon Main Store and Wetcat Main Store, find them and taste the sweetness of their fabulous treasures! 3- To receive the gift, simple touch the cake. You will be given an object that can be worn to unpack. 4- The prizes have funny names, no Area Search allowed! 5- There are no hints given. They are on plain sight. Very easy to find and this is more for the fun of it than anything else. 6- The prizes have been hidden at the GROUND LEVEL of the MAIN STORE (9 of them). Not upstairs. There is one extra prize to be found at Wetcat Main Store The balloon decorations are an indicator that there are some cherry cakes hidden in that room! 7- It is MANDATORY to HAVE FUN! The green house has been turned into a dance area for you to bring your loved ones and get them to move along some romantic tunes and help you hunting!